11° 44' N., 7° 5' E.
An eyewitness account of this meteorite fall was provided to Robert "Meteoriteman" Haag at the actual site. Haag related in his Meteorite Field Guide (1991) that a man who was chasing cows out of his cornfield near the village of Zagami Rock, Nigeria, suddenly heard a loud explosion and was buffetted by a pressure wave. Seconds later there was a puff of smoke and a thud about ten feet away. Fearing that an artillery shell had landed, the man waited for a few minutes before approaching the two-foot hole. The black rock was recovered and placed in a museum in Kaduna. a mineral composition in which maskelynites contain ~903600 ppm water, for which the relatively high D/H ratios are consistent with maskelynite interacting with groundwater that had exchanged with a D-enriched martian atmosphere (Tucker et al., 2014). the presence of trapped martian atmospheric gases, with isotopic percentages matching those measured by the Viking and Pathfinder missions. features of a weak gravity field acting on the crystallizing minerals. unique Mn/Fe ratios in pyroxene. a unique O-isotopic signature common to all SNC meteorites, but distinct from other meteorite classes. a positive match between basaltic shergottites (EETA79001B and QUE 94201) and a rock from the martian plains at Meridiani Planum, named Bounce Rock, from analyses of a suite of sophisticated instruments employed by the Mars Exploration Rover. The martian shergottite group was previously divided into two distinct subgroups, the basaltic and "lherzolitic" subgroups. In actuality, the "lherzolitic" shergottites do not contain the minimum abundances of olivine or orthopyroxene as those established for terrestrial lherzolites. Since there was no known petrologic relationship existing between the basaltic and "lherzolitic" shergottite subgroups, and these groups are resolved from each other on an O-isotope plot, the use of the term lherzolites was proposed by Eugster and Polnau (1997) to represent this unique group of martian meteorites. Thereafter, in an effort to resolve the discrepencies that exist between the official IUGS definition of lherzolites and the application of that term to the varied group of "lherzolitic" shergottites, Mikouchi (2009) addressed the need for changing the name of the "lherzolitic" shergottites to one that is more consistent and more broadly applicable. Since a texturally-based nomenclature is already employed for some shergottite subgroups, e.g., olivine-phyric, it was suggested that the term "pyroxene-oikocrystic" shergottites would be an appropriate name with which to encompass all of the various martian "lherzolitic" shergottites that exist in the worldwide collections. This would include intermediate, enriched, and postulated depleted "lherzolitic" shergottites, as reflected by a geochemical classification scheme. More recently, in an effort to rectify the discrepencies that exist in martian meteorite nomenclature, the textural term "poikilitic" was proposed by Walton et al. (2012) to apply to those meteorites previously referred to as "lherzolitic" shergottites, which is to be used along with additional descriptive terms for the bulk major element composition (based on Mg/(Mg + Fe); mafic, permafic, or ultramafic) and the trace element content (depleted, intermediate, or enriched) of a meteorite. An olivine-poor basalt subgroup comprising those meteorites with a volcanic origin derived from a fractionated magma and consisting primarily of the clinopyroxenes pigeonite and augite, in addition to having a high abundance of feldspathic glass (actually, most basaltic shergottites are more accurately termed komatiites based on their low plagioclase content and depleted trace element composition). A subgroup with olivine-porphyritic textures. The name picritic shergottite was suggested for this new subgroup by Barrat et al. (2002), while the name olivine-phyric shergottite was suggested by Goodrich (2002). Goodrich suggests that the term picritic shergottite implies certain petrogenetic characteristics, such as mixing of two compositionally distinct magma sources, which is not necessarily the case for all members of this new subgroup; therefore the purely descriptive term olivine-phyric is favored. Recently, several shergottites with both olivine and orthopyroxene megacrysts have been identified, which has led to the proposal of a new shergottite subgroupthe olivineorthopyroxene-phyric shergottites. Although ALH 84001 is an orthopyroxenite, and as such was characterized by the Planetary Chemistry Laboratory at Washington University as a subgroup of the nakhlites, its parental source magma has a composition that is consistent with the same mixtures of depleted and enriched REE end-member components that are used in a geochemical classification of the shergottites (Lapen et al., 2012). It was determined that the source magma of ALH 84001 contained a higher proportion of the enriched REE component than all other shergottites studied thus far. Therefore, ALH 84001 may be most appropriately classified as a subgroup of the shergottites. The shergottite group as a whole contains a large proportion of plagioclase feldspar, which was shocked to pressures of ~30 GPa creating maskelynite intergrowths. The presence of other high-pressure silica polymorphs, including cristobalite, high-pressure glass, stishovite, post-stishovite (only identified by cathodoluminescence techniques), and the newly discovered mineral liebermannite (Ma et al., 2015), suggests that localized regions experienced higher pressures of >40 GPa. The tiny, darkened melt veins in Zagami were formed as a result of shock-induced shear deformation, perhaps at low shock pressures (Bogert et al., 2003). The Zagami meteorite includes a range of lithologies formed through progressive fractional crystallization of the magma, which reflects increasing enrichment of FeO and incompatible elements (McCoy et al., 1999). Most prevalent (~80%) is the early-crystallizing normal lithology (NZ), composed of both fine-grained (FG) and coarse-grained (CG) components, which are crossed by shock-melt veins. The parent melt of the fine-grained lithology may have inherited a larger abundance of pre-existing pyroxene nuclei than did the coarse-grained lithology parent melt (Nyquist et al, 2006). Next in order to crystallize, constituting most of the remaining evolved, incompatible element-enriched rock, was an FeO-enriched component, the dark-mottled lithology (DML). The DML has been found to contain a small component (~10%) of late-stage melt pockets that are enriched in fayalite, phosphates, sulfides, oxides (e.g., ZrO2), and mesostases, and which contain a martian atmosphere component. However, these olivine-rich melt pockets contain an anomalous Sr-isotopic signature inconsistent with very late-stage fractional crystallization, and may instead reflect the infiltration of a highly evolved magma into a nearly solidified body (Misawa et al., 2012). The phosphates in these melt pockets consist primarily of whitlockite and contain ~5000 ppm martian water, reflecting either a very dry magma source or efficient outgassing. One very large, highly-evolved, olivine-rich melt pocket located in the DML component was named after its finder, David New (DN). A large apatite grain in the DN lithology was found to contain 30004000 ppm water with a high D/H ratio (Watson et al., 1994). Maltsev et al. (2015) extracted water from Zagami during stepwise heating, and the highest Δ17O value (between 200400°C) was found to be 0.1. This value is lower than that calculated for Zagami bulk rock (0.33), but higher than the terrestrial value; such variability is consistent with multiple isotopically distinct water reservoirs on Mars. Boctor et al. (2014) measured the water content and the H-isotopic composition of maskelynites from Zagami. They found that a wide range exists, ~1299 ppm, having a δD of ~5792532. In subsequent studies, Tucker et al. (2014) found water contents of ~903600 ppm having a δD range of ~0+1100. Further maskelynite analyses by Tucker et al. (2015) found water contents of 93223 ppm with a δD range of 93+849. Similar to other highly shocked martian meteorites, Zagami contains a significant concentration of martian atmospheric Ar within melt pockets (ave. 19.7 ppb), with a minor component present within shock veins (ave. 1.2 ppb). The favored scenario explaining the existence of this trapped gas component within the late-stage melt pockets argues for the initial introduction of martian atmospheric gas into pre-existing cracks and pores. Following the passage of a shock wave, sudden decompression and pressure release occurred creating bubbles within sub-mm-sized, localized melt pockets. Thereafter, as pressures became equilibrated, the trapped atmospheric gases migrated into the vesicles of the melt phase from the surrounding cracks and pores (Walton et al., 2007). Zagami is very similar to terrestrial basalts in even minor and trace element contents. Through studies involving O, N, and Cr isotopic compositions of martian meteorites, along with bulk planetary Fe/Si ratios, it is proposed that Mars accreted from early Solar System material comprising enstatite and ordinary chondrite material in a ratio of 74:26, in accord with a core that contains 6.7 wt% Si (Mohapatra and Murty, 2003). The clinopyroxene crystals in Zagami are composed of pigeonite and augite with Mg-rich cores, which suggests that initial crystallization began inside a slowly cooling, fractionating magma chamber (0.10.5°C/hr) at a depth of ~715 km. This was followed by a nucleation hiatus in which pyroxene grain-size increased at the expense of the smallest grains. The resumption of crystal nucleation and growth occurred during magma ascent and subsequent eruption onto the surface. Preliminary findings indicate that both olivine and pyroxene grains have a preferred orientation (Stephen et al., 2010), It was shown by Becker et al. (2011) that the weaker foliation associated with the coarse-grained pyroxene of the NZ lithology, in contrast to the fine-grained lithology, was not formed by a strong directional flow; perhaps more consistent with a shallow intrusive. In a study of the light lithophile element concentrations in Zagami pyroxenes (Herd et al., 2005), particularly that of the incompatible element Li, it was found that Li exhibited significant zoning, decreasing from core to rim by 51% (and by 75% in Shergotty). This zoning has been attributed to possible postcrystallization partitioning of Li into magmatic water, which was subsequently degassed; however, shock-induced diffusion from the rims remains another possible alternative. In a related study of the Li systematics in NWA 480, Beck et al. (2004) found that Li in the pyroxenes reveals a large isotopic variation from core to rim, but that it also maintains a constant concentration. They suggest that these compositional trends for Li reflect the loss of Li (i.e., mass-fractionation) from the crystallizing melt through the degassing of water-rich fluids, a process similar to that proposed to have occurred in Zagami and Shergotty. The OsNd isotopic variations in Zagami and other shergottites suggest that a single parent magma assimilated an LREE-enriched crustal component before cooling (Brandon et al., 2011). On the other hand, the failure of crustal assimilation models to realistically reproduce the isotopic variation observed among shergottites has led some investigators to consider alternative models involving source mantle heterogeneity. The enriched (upper mantle, 200450 km deep) and depleted (either upper or deeper mantle) shergottite end-members are thought to reflect crystallization and mixing of cumulates with trapped residual melt at various depths within a 2,000-km-deep magma ocean, following 8993% crystallization. 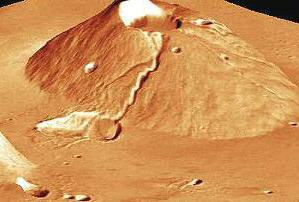 These conditions are consistent with an origin in a typical Tharsis-type, volcanic magma chamber, such as Olympus Mons (see photos below). Some studies suggest that a later period of rapid cooling in a lava flow 10 m thick produced the Fe-rich rims on the pyroxene cores and created the partial flow alignment of the crystals (exhibited in the NZ lithology only). Using UPb, RbSr, SmNd, and LuHf isotopic systematics, it was determined that Zagami formed from one of the most highly fractionated and evolved magma sources on Mars very early in Solar System history that existed ~4.558 b.y. ago. It was further ascertained through concordant isotopic chronometers that crystallization of Zagami from the molten state took place as recently as ~166 m.y. ago (DML and CG lithologies), similar to the crystallization ages obtained for Shergotty and Los Angeles. The FG lithology gave an age of ~177 m.y., with a subsequent cosmogenic correction modifying the age to 223 (±6) m.y. A study of Ar systematics by Korochantseva et al. (2009) resulted in a whole rock age of 200250 m.y. for Zagami and ~400 m.y. for Shergotty. The isotopic and lithologic heterogeneity within Zagami is thought to be a result of magma mixing or brecciation (Nyquist et al., 2010). On the other hand, some believe that these chronometers do not reflect a recent crystallization on Mars, but instead, consider the young ages to represent a major impact resetting event associated with observed shock effects ranging from mosaicism to maskelynization of plagioclase feldspar, which are features consistent with a shock stage of S45 (2055 GPa). In support of such an event, studies of shergottites by Goresy et al. (2013) revealed evidence of pervasive melting (amounting to at least 23 vol%) of feldspar (producing maskelynite), pyrrhotite, titanomagnetite, and ilmenite, along with partial melting of clinopyroxene, as well as the presence of various high-pressure polymorphs; all of these features present a high probability that the radiometric ages have undergone shock-induced resetting. It has been argued by some reseachers (e.g., Chen and Wasserburg ; Bouvier et al. [2007, 2009]) that the PbPb and ArAr isochrons of shergottites represent an old crystallization age of ~44.5 b.y. However, the inferrence of an ancient crystallization age for Zagami and other shergottites, and the hypothesis that was advanced ascribing the young ages to isotopic resetting during a secondary impact event, has been shown to be inconsistent with the degree of shock-heating the meteorites have experienced. In other words, Zagami does not exhibit petrological features of post-shock heating to the degree which would cause a loss of an amount of 40Ar commensurate with an age of ~4 b.y. (Bogard and Park, 2007). Moreover, high degrees of shock would have led to chemical and isotopic equilibration of olivine and pyroxene, and the observed igneous zoning would have been obliterated (J. Jones, 2007); in fact, very little shock melt is present. Moreover, the concordant ages determined for the ReOs, RbSr, LuHf, and SmNd are inconsistent with shock resetting (Brandon, 2012). The isotopic anomalies observed in the PbPb and ArAr systems were considered instead to be the result of impact ejection (~30 GPa for Zagami with a temperature increase of ~70°C). More recently it was asserted by J. H. Jones (2015) that the old ages calculated for shergottites based on the PbPb system do not represent the shergottite crystallization age, since the Pb was likely not produced through in situ decay, but instead may have been inherited or incorporated after shergottite crystallization, or perhaps more plausibly, that it represents terrestrial contamination. They concluded that the old Ar-based ages are inaccurate due to inherited 40Ar, while others have attributed the old ages to inaccurate corrections for cosmogenic 36Ar. Therefore, the young shergottite crystallization ages based on RbSr and SmNd isotopic systems are generally considered to be the most accurate. In their ArAr analyses of Zagami minerals representing distinct magma sequences, Bogard and Park (2008) concluded that the excess 40Ar was neither the result of shock-implantation of martian atmospheric gas nor the remnant of in situ decay of 40K from a rock that crystallized 4.1 b.y. ago. The former scenario is inconsistent with the correlation that is observed by Korochantseva et al. (2009) between the atmospheric Ar component, which was trapped during a secondary event, and the radiogenic Ar component, which chronicles the time of crystallization. In the latter scenario, a higher 40Ar concentration in plagioclase than in pyroxene would be expected, which is not the case. Bogard and Park (2008) concluded that the excess 40Ar present throughout Zagami was likely inherited from the source magma or obtained by assimilation of K-rich crustal material during the early magma phase. Their finding that the 40Ar concentrations are the same among the various minerals in Zagami is thought to reflect the modulation of radiogenic gas through a pressure release mechanism as the magma rose from a depth >7 km toward the surface. It was proposed by Bouvier et al. (2005) that the RbSr ages of shergottites were reset through groundwater dissolution of phosphates within the martian rock. However, the RbSr age was obtained after removal of the phosphates, and it was demonstrated by Nyquist et al. (2009) for the shergottite NWA 1460 that the RbSr isochron as well as other isochrons result from trace element partitioning during igneous crystallization; they consider that these isochrons accurately date this petrogenetic stage. Albarède et al. (2008) proposed that the resetting of radiogenic chronometers could have occurred as a result of extensive percolation of hot sulfate-rich fluids, and thus argue that the 4.1 b.y. crystallization age is the accurate age. However, no signs of such alteration are observed, and the distribution of radiogenic Ar present among different minerals is inconsistent with known diffusion mechanisms. Furthermore, the SmNd data were shown to be unaffected by any such groundwater metasomatism processes, while a low-temperature alteration disturbance of the PbPb chronometer was shown to be inconsistent with shergottite features. Other investigations of in situ UPb were conducted on baddeleyite (zirconium dioxide), a late-stage crystallization mineral that forms readily under conditions of high oxygen fugacity (Herd et al., 2007, 2012; Misawa and Yamaguchi, 2007). It was found that UPb systematics remain undisturbed at shock pressures up to 57 GPa and temperatures up to 1300°C, and accurately reflect a very young age for Zagami and other shergottites of ~166 m.y. and 182.1 (±6.9) m.y. Further studies utilizing RbSr, SmNd, ArAr, and UPb ages all show consistently young ages for Zagami of approximately 166 m.y. (Borg et al., 2005; Park and Bogard, 2007). An ArAr age study by Korochantseva et al (2009) was complicated by excess Ar, but they determined an age for Zagami of 200250 m.y. In support of a young crystallization age for the shergottites, Walton et al. 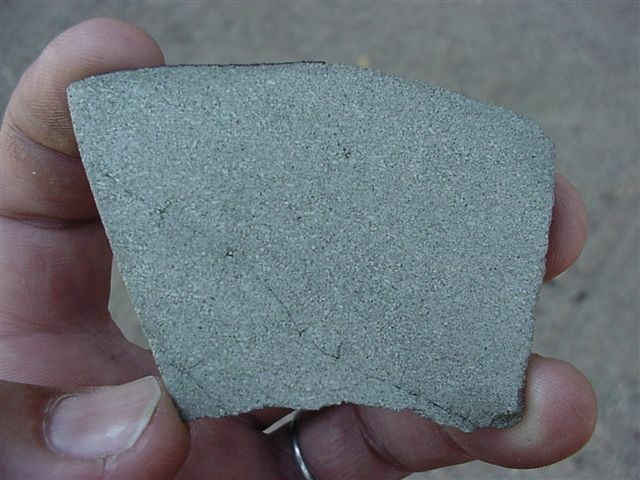 (2008) propose that the bias for young ages determined for the majority of martian meteorites reflects the selective influence of crystalline, consolidated, unaltered, unbrecciated, and unweathered material in the ejection process. This type of rock is typically located in fresh volcanic terranes at higher elevations (lower atmospheric density) which favors a successful impact ejection. A young age of formation for shergottites was also determined through isotopic studies conducted by Humayun et al. (2013) and Moser et al. (2013), a synopsis for which can be found in a PSRD article by G. Jeffrey Taylor: "The Importance of When", June 2014. The age discrepancy of shergottites was addressed by Blinova and Herd (2009) in a study involving the petrogenesis of the depleted shergottites. They proposed a three-stage formation model in which the ancient age of 4.535 b.y. for the depleted shergottites, as shown by PbPb and RbSr data, corresponds to the initial crystallization of the magma ocean. The investigators envision that both a Deep Mantle Source and a more shallow Naklite Source were formed at that time. A partial melting event affecting the Nakhlite Source occurred 1.3 b.y. ago, leaving a slightly depleted Nakhlite Residue component; they designated this event the Nakhlite Event. About 500 m.y. after the Nakhlite Event, an ascending hot plume (and possibly many) brought the depleted Deep Mantle Source into contact with the Nakhlite Residue, producing the depleted shergottite parental source magma (for which Y-980459 is a close match to this parental melt composition). Differential mixing of the Deep Mantle Source and the Nakhlite Residue could have produced the various compositions of depleted shergottites, while the enriched and intermediate shergottites could have formed through lower degrees of partial melting of more volatile-rich material located at greater distances from the plume. Their model also explains the SmNd isotopic signatures observed in shergottites, including the young ~1.3 b.y. age, and it provides an explanation for the various redox conditions observed in the shergottite suite; i.e., enriched shergottites were formed by partial melting of volatile- and incompatible-element-bearing trapped liquid in the parental source magma. The problem of anomalously old shergottite ages obtained through 40Ar/39Ar chronometry was investigated by Cassata and Borg (2016). They determined that previous cosmogenic correction techniques for 36Ar were not accurate, so a new technique was applied in which cosmogenic corrections are based on CRE age data for un-irradiated material, while step-wise production rate estimates are implemeted taking into account spatial variations in Ca and K. Using this new ArAr dating method, they obtained young ages for two shergottites (NWA 4468 and NWA 2975) that are in accord with ages based on other radiometric chronometers. By comparison, application of the common cosmogenic correction techniques to the same two shergottites led to erroneously old CRE ages that correspond to anomalously old isochron ages. A subsequent shock event, which occurred ~3 m.y. ago, probably represents the ejection of this rock from Mars. Studies of the impact-melt glass veins have identified fine-grained material that is enriched in a felsic component and depleted in a mafic component (Rao and McKay, 2002), as well as having an elevated sulfur abundance (Rao et al, 1999) and possibly an elevated Pb abundance (Borg et al, 2005). It is proposed that this impact glass material represents martian soil that was mechanically fractionated through impact gardening and metasomatism processes, and was then incorporated into the melt phase. The Mars ejection age for Zagami pyroxene based on 37Ar is 2.23.0 m.y., determined by adding together the cosmic ray exposure (CRE) age and the terrestrial age (Eugster et al., 2002). The ejection ages of several other basaltic shergottites, including Shergotty (3.0 ±0.3 m.y. ), Los Angeles (3.0 ±0.3 m.y. ), and QUE 94201 (2.8 ±0.3 m.y. ), suggest that they all may have experienced a simultaneous ejection event on Mars. Other olivine-bearing shergottites, including Dar al Gani 476 (and pairings) and Sayh al Uhaymir 005 (and pairings), have very similar ejection ages of 1.24 (±0.12) m.y. and 1.01.4 m.y., respectively. Their similar CRE ages, bulk chemical compositions, 26Al concentrations, and textures, may represent a common magma source and ejection event from Mars. The shergottite EETA79001 has an ejection age of 0.73 (±0.15) m.y. and may be associated with the DaG 476 ejection event, or alternatively, it may represent a late breakup in space of the lherzolitic shergottite meteoroid consistent with its content of lherzolitic-type xenocrysts. All of the lherzolitic meteorites found so far have ejection ages that closely coincide (3.8 ±0.7 to 4.7 ±0.5 m.y. ), indicating a likely ejection from Mars ~1 m.y. before most of the basaltic shergottites, or possibly that they crystallized later at depth. Cosmic ray exposure ages have now been determined for many more martian meteorites and Mahajan (2015) compiled a chart based on the reported CRE ages for 53 of them (out of a total of ~80 known at that time). He concluded that together these 53 meteorites represent 10 distinct impact events which occurred 0.92 m.y., 2.12 m.y., 2.77 m.y., 4.05 m.y., 7.3 m.y., 9.6 m.y., 11.07 m.y., 12.27 m.y., 15 m.y., and 16.73 m.y.see his chart here. In a subsequent review based on multiple criteria, Irving et al. (2017 [#2068]) made a new determination of the number of separate launch events associated with the known (101 at the time of their study) martian meteorites. They speculate that the number could be as few as twenty, and suggest that Zagami and at least 26 other enriched olivine-free mafic shergottites were probably ejected in a few separate impact events ~25 m.y. ago. A study was made on Zagami in which calculations were made of shock veins in order to determine the duration of the shock wave at impact (~10 ms), and with that, the commensurate size of the impact crater that was formed. 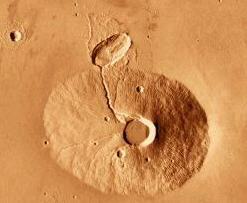 The results indicate a crater size of 1.55.0 km (Walton et al., 2008). Additionally, an excellent candidate for one of the source craters that led to the spallation of the late-forming shergottites is the 10.1-km-diameter rayed crater Zunil, which is the most conspicuous crater located in the young, Amazonian-aged (1.8 billion years ago to the present day), lava-covered Cerberus Planum within Elysium Planitia. 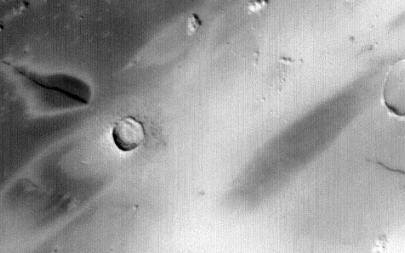 Other shergottites may have been ejected from the young terrain at the base of the Ceraunius Tholus volcano in the Tharsis province, or from similar young craters reflecting ejection events consistent with CRE ages of <18 m.y. Based on data from the Infrared Mineralogical Mapping Spectrometer aboard the Mars Express orbiter, the best fits mineralogically are in the older volcanic terrains of the southern highlands including Syrtis Major, Thaumasia Planum, and Herperia Planum (Ody et al., 2013). The specimen shown above is a 21.0 g cut fragment of the coarse-grained component from the NZ (normal Zagami) lithology containing oriented pigeonite crystals and a segment of a black glassy shock-melt vein at the top edge. A large oblique impact at the base of the Ceraunius Tholus volcano may have ejected material towards Earth.